The ground floor of the new facility houses a 2,200-seat, intercollegiate basketball arena that is reconfigureable as three regulation basketball courts, a physical fitness center and classroom, varsity locker rooms, athletic ticket offices and a concession area. 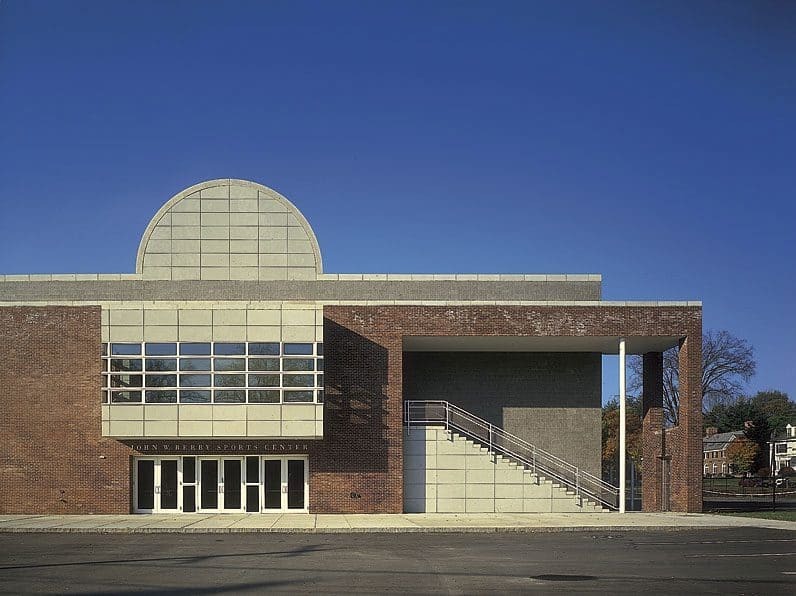 The second floor, reached by two stairs and a bridge from the renovated Alumni Gymnasium, houses seven competition squash courts, six racquetball courts, a dance studio and bleacher balconies for spectators. The facilities are accessed from a barrel-vaulted, skylighted gallery, culminating in a bay window overlooking the entry. Horizontal and vertical circulation elements wrap around the three sides of the basketball arena, allowing natural light into the fitness center and dance studio. The choice of exterior materials addresses contextual constraints and articulates internal volumes as well as the layered organization of the plan.